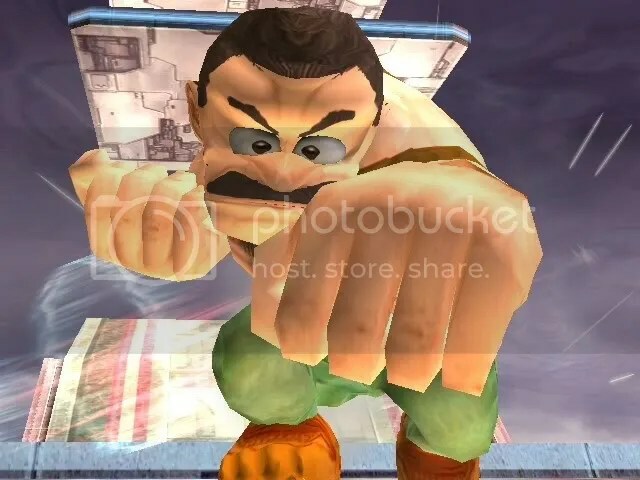 The mayor of Metro City, Final Fight’s Mike Haggar joins the brawl. Presumably while on his way to Marvel vs Capcom 3. Finally. Done with schoolwork for the rest of the year. Secured a workspace. Reclaimed motivation. Time for piledrivers. So I guess I promised a Zangief. It exists, but about halfway through making it (which I guess places that somewhere between two weeks and two years ago), I noticed that, you know, it would be a lot faster to shift gears and make Haggar instead. And then once I was done it would actually be easier to go forward and finish the Zangief, because I’d have most of the texturing done already. I thought about releasing them at the same time, but it’s been far too long as it is, and the rest of you are making me look bad. So I’ll just send this out. The texture has some issues, as always. DK turned out to be a pain to work with. His forearms appear to have non-euclidean texture mapping and smashing his toes into shoes leaves some ugly shading behind. He also has one too many suspenders, but, not much to be done about that. Very nice. This could give way to a lot of nice Humanoid characters on DK. Credit will be given of course.